even though this "melon" isn't cooling and juicy, it's just as delicious. Besides, its "skin" and "seeds" are edible! Not only is the skin edible, but it is also a very yummy green tea flavor! In fact, while baking, it filled the entire house with the aroma of green tea, mmm! 1. Preheat oven to 150°C, fan-baked. 2. Mix cake flour and red yeast rice powder in a bowl. 3. Beat yolks, sugar and salt with a hand whisk until pale. Add oil and fresh milk. Stir well after each addition. 4. Add flour mixture in 3 separate rounds. Use a spatula to mix until smooth and free of lumps. 5. Beat egg whites until frothy. Add sugar in 3 separate rounds and beat until stiff peaks are formed and it looks glossy. It is ready when you turn the bowl upside down, the egg whites should stay without falling. 6. Give a gentle stir to the egg yolk mixture. Fold 1/3 of egg whites into the yolk mixture. Then, pour it into the rest of the egg whites. Fold until just combined. 7. Pour into the chiffon pan, lift & drop the pan gently to remove air bubbles. 8. Bake at lower middle level for50 - 60 minutes or until a cake tester comes out clean. 9. Invert immediately and let to cool down completely on a wire rack. 1. Soften the butter at room temperature. Add in icing sugar,stir well. Add in cake flour and green tea powder, mix until well combine. 2. Beat to loose the egg white and add in into the mixture. After the add in egg white, the sticky mixture will turn into smooth and runny texture. 3. Scoop the mixture into a piping bag. Cut a samll hole at the piping bag,pipe 6 - 7 strips on the lined baking paper's tray. 4. Use chopstick to draw out the watermelon skin's pattern. Then put inside fridge for later use. 1. Beat the egg yolk with sugar until fluffy. Dissolved the green tea powder with 2 tbsp warm water into paste. Add the paste and cake flour into the egg yolk mixture，stir well and set aside. 2. Beat egg white until frothy. Mix the frothy egg white with the egg yolk mixture. Then scoop the mixture into the baking tray(above the skin strips). lift & drop the pan gently to remove air bubbles. bake with preheated oven at 180'C for 15 minutes. 1. Invert the chiffon cake on the rack once unmould. 2. 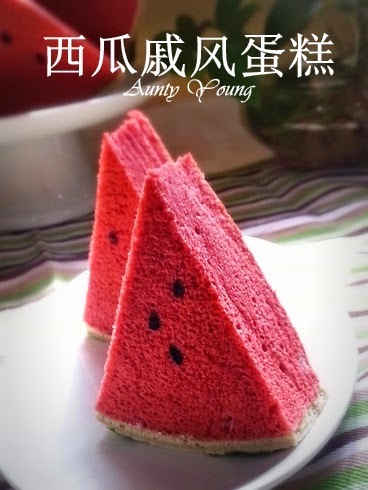 Cut 3 strips of the watermelon skin according to the chiffon cake 's height. 3. Join the watermelon skin with the flesh by spreading some whipped topping cream for both. 4. Finally mix some charcoal powder with some watermelon strip's batter in a bowl . Use it to draw the melon seeds,then done. 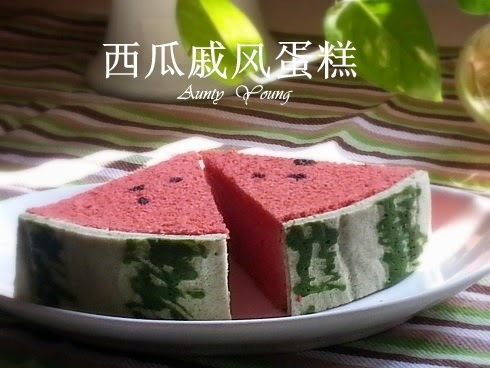 Originally made for the fun of it, I realized this Watermelon Chiffon Cake was not only cute, but also full of the fragrance of green tea and red yeast rice. A yummylicious cake! Wow.....such an art of work. Beautiful. Well done. This is amazing Aunty Young, you are super baker. Wow! Aunty Young, I am so impressed! Really look like watermelon lah! 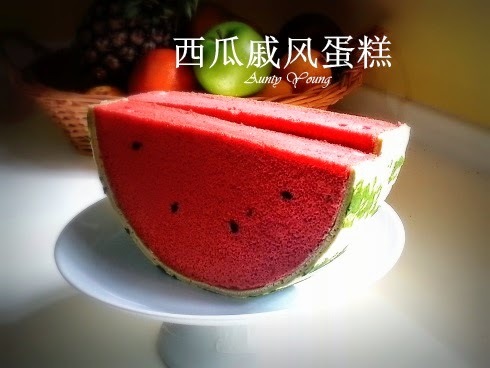 Wow, this look exactly like watermelon! well done! wow really impressive! looks like real water-melon, so pretty, can't bear to eat it. 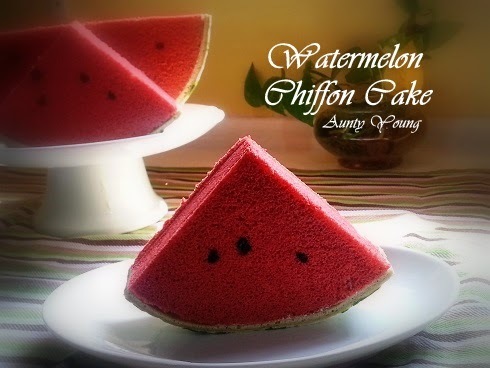 Hi Aunty Young, really, really lovely watermelon chiffon. Amazing. Bookmarked. Hi Aunty Young - so lovely and creative chiffon. Maybe will try it out! May I know which brand red yeast powder you are using? where do you buy it? Hello Aunty Young, bet you will be receiving lots of Wow! Yes this is very impressive ... like a piece of art ! You are so clever! Your chiffon looks like watermelon slices, so beautiful. You are so innovative! Such a lovely cake. 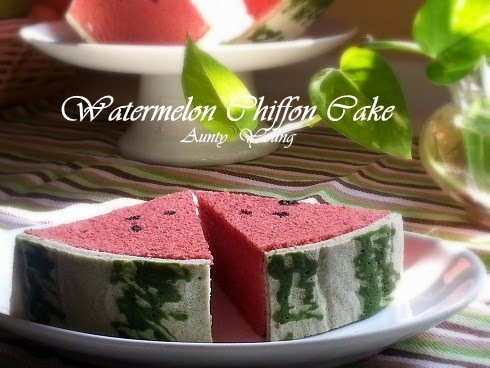 Amazing cute watermelon slice cake. WOW! 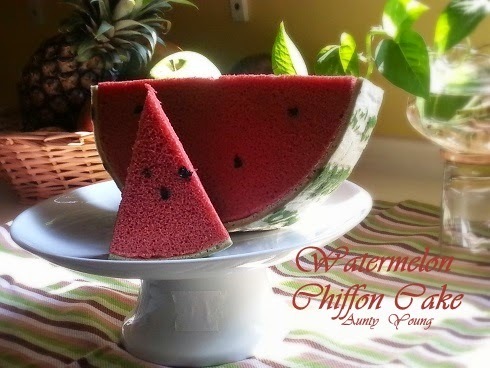 Your watermelon chiffon cake looks amazing! It is beautiful with lovely soft texture! 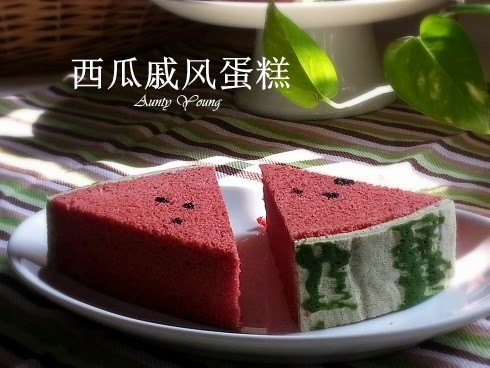 I had some juicy and sweet watermelon last night, and never thought I would see it in a cake today! You have done a superb job, really neat and perfectly made! Thank you for sharing with Bake-Along! What a stunning cake! I really love it a lot. Wow! I'm blown away! So real. 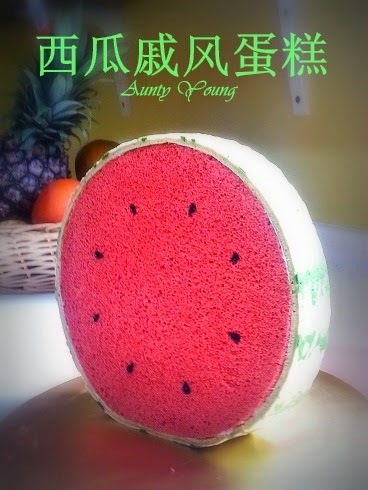 Best watermelon cake I have ever seen. A beautiful cake indeed, simply gorgeous! i hv never seen something like this..this is such a brilliant idea, a very creative one! i can never do the prints on the chiffon cake ( for eg like your case, the watermelon skin ) , i've tried that twice and they turned out ugly..haha! 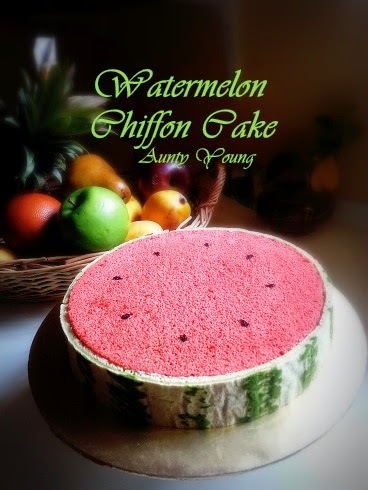 thanks for baking this super creative watermelon chiffon and share it with us and also your picture tutorial. Good learning for me, cheers! This is so pretty and fun! I'm so impressed by the design and by the photographs. Awesome cake! ❤️❤️❤️ You're so talented!